Beware of the Bait and Switch Mortgage Strategy- Don't Be Scammed! The real estate market has its share of crooks and scammers just like any other industry. Unfortunately, the ones getting scammed are usually hard working Americans who just want, like most people, to become home owners. Becoming a home owner is difficult and expensive enough without getting tricked by lenders and mortgage brokers, so you will have to pay a lot of attention when buying a home, especially if it is your first time doing it. If you are not careful, you can end up with a mortgage that is much more expensive than what you can afford, and you will have to struggle to make your mortgage payment each month, or eventually have to abandon your home. 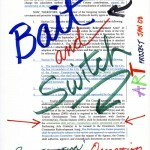 What is the Bait and Switch Mortgage Strategy? When buying a home, you can encounter dangers at every corner: from thieves posing as lenders or lawyers, who usually prey on the elderly, to the old bait and switch. Bait and switch happens when a customer is offered something for an attractive price, also known as the bait, which will no longer be available when the customer decides to go ahead and make the purchase. After the customer realizes that the initial offer is no longer available, he or she will be presented with a new offer, with less attractive terms, also known as the switch. Lenders usually do the bait and switch by advertising low interest rates in order to get many potential home buyers interested. These interest rates are promoted in newspapers, on TV, on the radio, on billboards and posters, but, when the customer shows up and applies for a mortgage, he or she is told that those were last week’s rates or that they are reserved only for those with very high credit scores and a very good financial situation. Of course, because bait and switch is illegal, lenders disclose all this in the small print, which is usually too small to read in a newspaper, moves too fast to be read on TV, or is simply disregarded by most people who are looking for a mortgage. The truth is that interest rates change too often for the advertisements to be truthful. Commercials on TV and the radio are very rarely modified to display the correct interest rate, so they may run for a couple of months advertising an interest rate that was offered a long time ago, and the rate can be much higher at the present time than it was before. Even live interviews advertise rates that are at least a few days old. When home buyers call the lender to inquire about the low interest rate, they find out that the rate is no longer available, but are offered a new rate. This new rate won’t be as great as the one that is advertised, but is usually not that much higher. However, a small increase in interest can mean thousands over time, so make sure that you understand how much more you will be paying before taking the lender’s offer. Ads in newspapers are also at least one day old because it takes at least one day for the newspaper or magazine to get published. In a perfect world, interest rates would not be advertised unless they were actually available for everyone. While some lenders are truthful when advertising interest rates, most take advantage of things like fine print and are just happy to get customers interested, even though they are unable to offer what they promised. Unfortunately, many home buyers fall for the bait and switch due to the fact that many lenders are doing it. When searching for a mortgage you should give yourself time to shop around and find what’s best for you, and not let lenders use the bait and switch mortgage strategy on you. If you are not satisfied with a lender’s offer, always be ready to turn around and walk away.